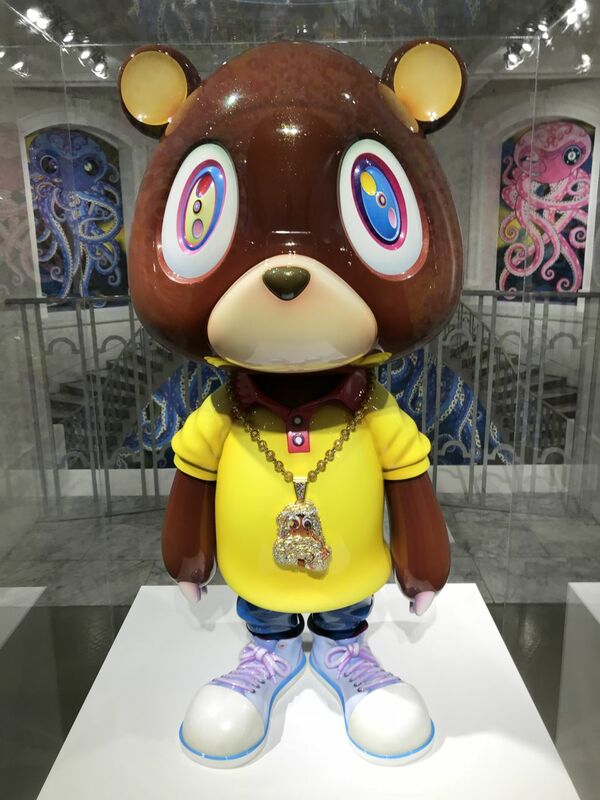 Takashi Murakami is a famous Japanese artist who is known for his commercial work -- collaborations with Louis Vuitton, an album cover for rapper Kanye West (in 2007) and music producer Pharell Williams. 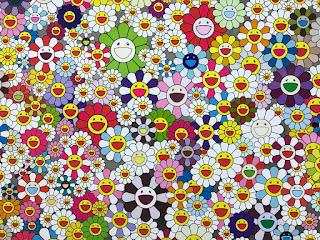 But at the same time Murakami's work is exhibited in museums and sold at auctions. 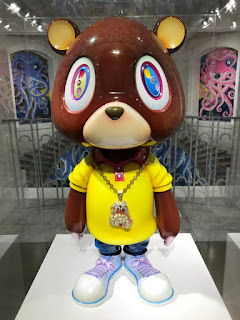 His show, Takashi Murakami: The Octopus Eats Its Own Leg, closes tomorrow at the Vancouver Art Gallery and my friend and I had a chance to catch it a few days ago. It's a major retrospective that spans three decades of his career, featuring more than 55 works. 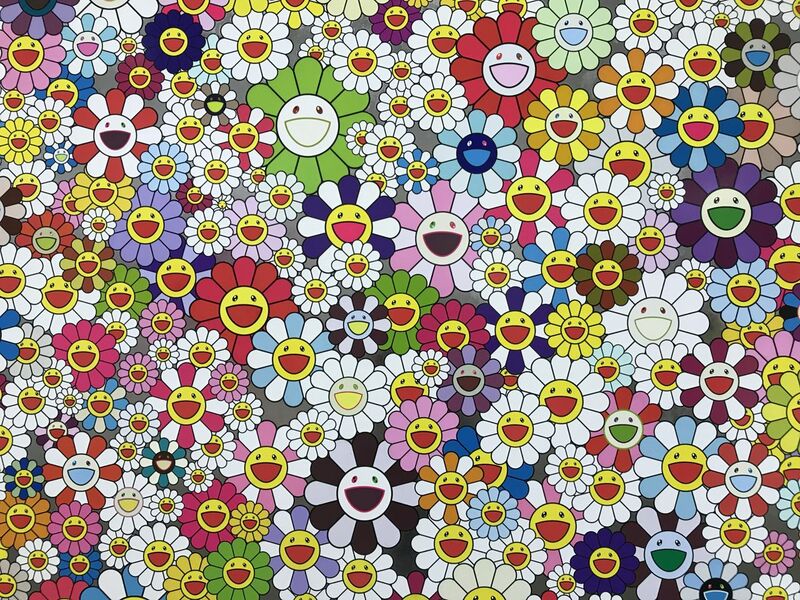 It turns out that Murakami has a PhD in Nihonga, a traditional style of Japanese painting, but he wanted to explore the boundary between fine art and commercial art, like anime, a concept he calls Superflat. To Murakami, superflat is as if a metaphorical atomic bomb has flattened high art and low culture. He created an anime character called Mr. DOB that kind of looks like Mickey Mouse, but in some cases you can see bits of Murakami in it. He uses Mr. DOB in various ways and it becomes more and more abstract and bizarre. His works featuring the character look like anime happening simultaneously with various references. I love his flowers -- they are daisies with smiling faces -- what's not to like about them? These flowers while they are his earlier works, can be seen in later ones with Mr. DOB or they pop up in other pieces as if to add some comic relief. However not all his art is frivolous. 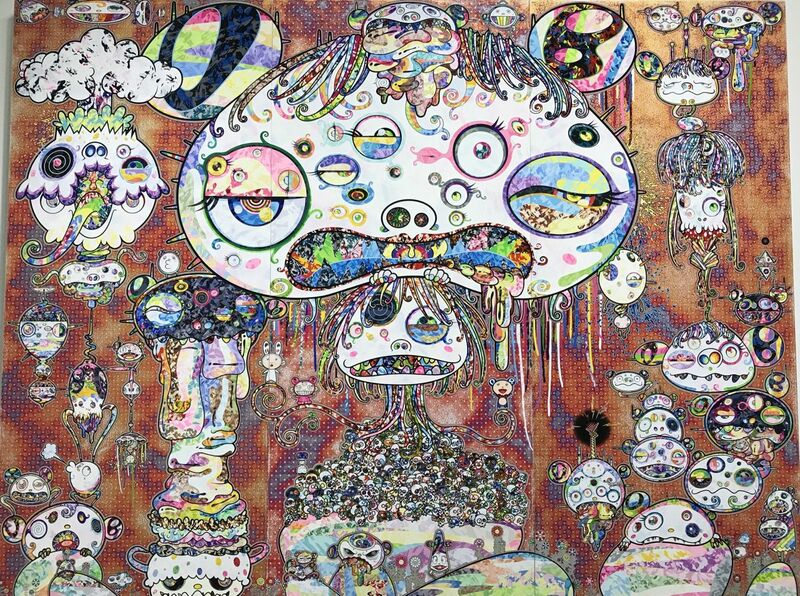 When the earthquake and tsunami hit Japan on March 11, 2011, Murakami was profoundly affected by it and sought to process the shock and sadness through his art. He created works featuring ahrats, or Buddhists who have advanced on the path of Enlightenment but have not yet reached Nirvana. He has created a piece featuring 100 Ahrats, each one different from the other, old men with scraggly faces, looking learned or have suffered profoundly for their beliefs. The piece seems dark, but at the same time there is a colourful background, perhaps showing the contrast of life and death. 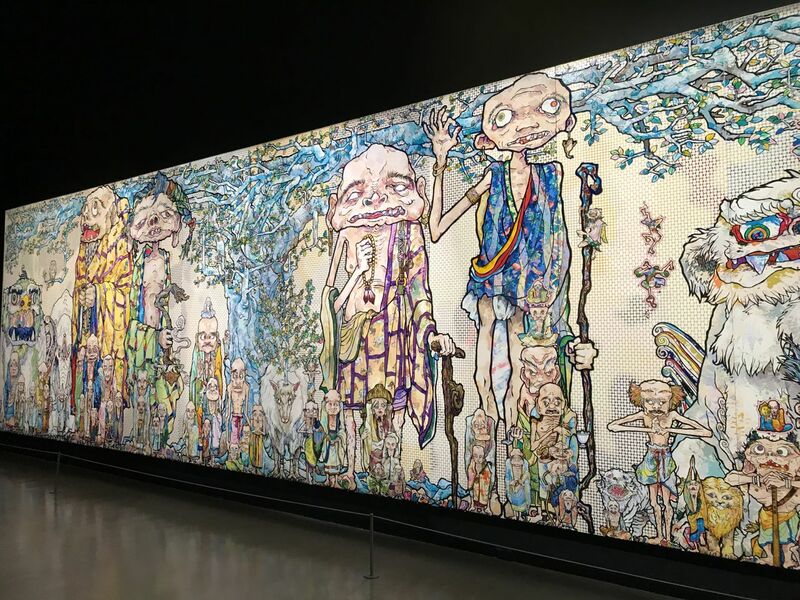 The process of how Murakami creates his works is also fascinating. He starts off with his original sketch of what he wants to do. This is scanned into the computer and refined. 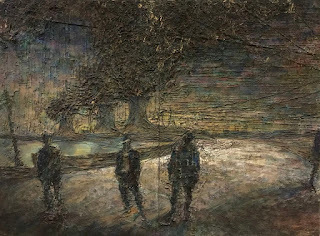 Once the composition is approved, it is then blown up to a huge size, into several panels and teams making up over 100 people start working on them. Using a kind of silkscreening process, the bright colours are placed layers on top of layers and then some parts of gone over again manually with a paint and brush, others decorated with gold leaf. 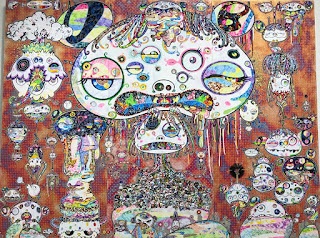 Murakami has a giant catalog of silk screens with patterns that are used over and over again, which is what helps him create works in a kind of mechanical way. He inspects each piece before he deems them finished, and this can be a painstaking process as the designs need to perfectly connect together, let alone the silkscreening process. If you see enough of his works you will see repetition of textures and designs. Perhaps what makes Murakami legitimate is his having studied a PhD in traditional art, and then periodically referring to the past, some pieces harking back to antique lacquer works, yet his flower designs are there, or a cartoon-like lion that is a reminder of a centuries' old Japanese lion as if to give him legitimacy in the art world. 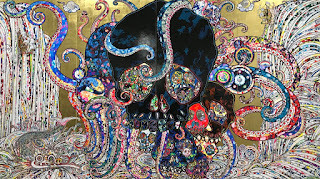 However, he doesn't seem to regard art as "low art" or "high art" -- they are all art to Murakami. 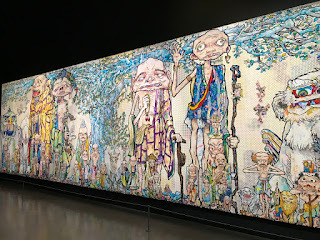 Another interesting aspect was that two large pieces weren't completed on time for the Vancouver show -- they are called TBC and if you first look at them, they seem finished, but if you look closer, there are outlines of characters that have yet to be filled in. Murakami writes a note to visitors of the show, apologizing that he didn't have enough time to finish them. He knows this doesn't absolve him of not meeting the deadline, but at the same time do his fans really care? The show is strangely called The Octopus Eats Its Own Leg because in extreme circumstances, an octopus will eat its own leg for survival, but at the same time it does this knowing the leg will grow back. 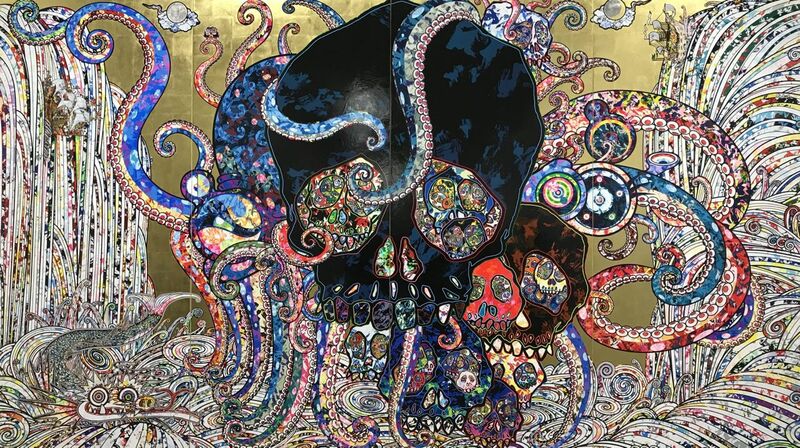 So Murakami sees himself as an octopus, growing and evolving his art. However, at least two of his series of prints were sold out, one priced around CAD$1,200, the other at over CAD$5,000. 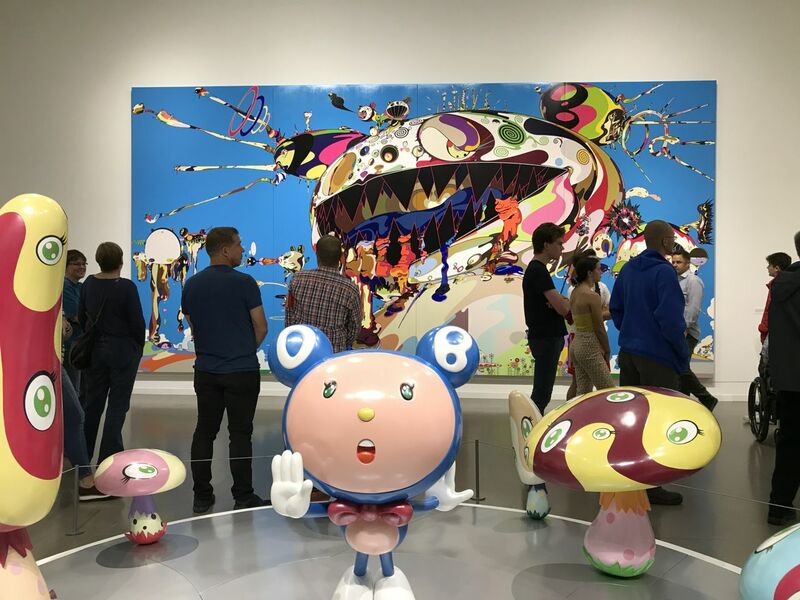 Murakami must have been a blockbuster show for the VAG and good on it for snagging such a top popular artist. So many young people came to check out the exhibition and it also gives everyone a better understanding of where the artist is coming from. I certainly learned a lot! The show next goes to the Modern Art Museum of Fort Worth.